Roth Händle studios: My name is Mattias Olsson and Im a stompbox addict. My name is Mattias Olsson and Im a stompbox addict. Hi my name is Mattias Olsson and Im a stompbox addict. I have always loved stompboxes. I loved how a guitarist or keyboard could press a stompbox and change the sound in a fast radical way. They always had cool names like the Big Muff, Fuzz Factory, lo-fi loop junky, Funk-a-duck or the Clone Theory. The box you see above is the utopia synth. How cool isnt that...the amount of promise fitted into that green case (its a synth though not a stompbox per se....). Also I love how simple it is. One cable in and one cable out...And then you can start combining them. Woohoo. The possibilities are endless. The problem is generally finding the right adapter for the pedal but apart from that its easy. I was out running today and came up with a stompbox I need. Maybe you can help me build it or you know someone who knows someone. It is a three or four channel autopanner. One channel in and four out. I want the autopanner to step through the other four channels. There should be a ratecontrol to control the speed...and if I could hope for something remarkable it would be a random knob so that it would bounce around the outputs. It would be great if it faded between the channels but that isnt too important. But it would be cool if the channels had a little light so you could see which one was on. is if you arent interested in stompboxes at all. 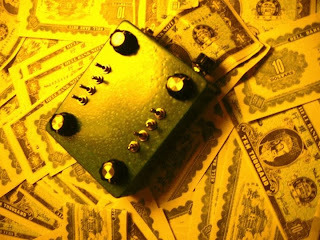 Look at it for a while....if you are not interested in stompboxes your blog experience probably stops here. Please come again. The idea isnt the pedal itself but what you put after the outputs...Imagine a fairly flat drumrhythm and then you put four different delays on the outputs so that the echoes change constantly. Or distortion pedals with different eqs. Its going to be magical. I know it. You know it. Now lets build it. nah just kidding here it is.